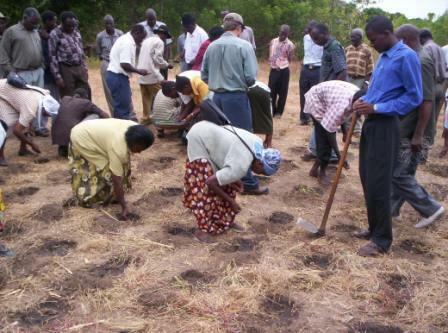 Farming God’s Way is a “new” approach to farming in Kenya. Not that the method itself is new…the program we teach was first developed in 1984, and the basic foundation of the process is as old as the earth itself. For generations Kenyans have taken from the soil and given little, if anything, back to it. The farms are left barren in many cases, and at best lacking in the needed nutrition for good crop formation. For those who have embraced the Farming God’s Way method of farming, they have seen an incredible increase in yield, often doubling and tripling, and in some cases an increase of tenfold has occurred. With drought and pestilence rampant in Kenya, the changing of how Kenyans farm and manage their soil is critically needed. Africa is known as the “Begging Bowl” of the world, but in reality, if African farmers would embrace this method of farming, it could rapidly become the “Bread Basket” of the world instead. On the new MpM property we are developing farming plots which will be utilized in training Kenyans in this improved method of farming. Never plowing, leaving the mulch on the ground (God’s blanket) to hold in moisture, and practicing rotations of crops all play a part in managing the soil properly, the way the master farmer, God, intended. Farming God’s Way has proved itself to bring an overflow of blessings out of the fertile earth that God created!.